David Eraker believes agent commissions are bloated. In November, the former Redfin CEO launched Surefield, a seller-focused brokerage designed to slice agent fees using cutting-edge, 3-D virtual tour technology. The full-service Seattle-based firm charges sellers a 1.5 percent commission (with a minimum fee of $7,500) and caps buyer’s agents’ compensation at $2,000. The brokerage is betting that the ubiquity of listings online and the virtual 3-D models it produces for all its listings can free sellers from “prepaying” a buyer’s agent’s commission. Surefield has 25 listings and wouldn’t disclose how many deals it has closed. All of its agents are salaried. Surefield’s home tour technology allows buyers to virtually walk through a home, giving them a realistic look of the space without having to visit in person. The digital models also include drone-like, aerial 3-D views outside the home. Surefield asks prospective buyers to view the models before deciding whether to visit a home in person, which should reduce the number of home-visit requests. Eraker co-founded Redfin in 2002 and ran the firm as CEO until 2006, when he left to pursue work outside of real estate. Surefield’s co-founder and chief operating officer, Rob McGarty, worked as a Redfin agent and a director of its lender program from 2006 to 2010. Surefield points to the real estate commission model in developed countries outside the U.S. and Canada — where sellers pay between 1 and 2.5 percent to agents to sell their home — as evidence that its model has a chance here. 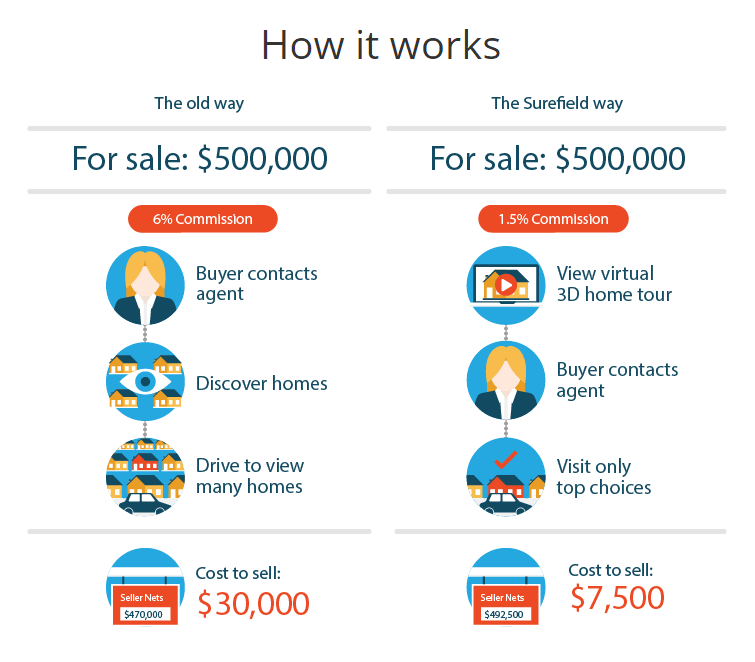 “For the first time, sellers don’t have to automatically pay for the services of buyer’s agents; buyers can realistically tour homes 24/7, and home prices won’t be artificially inflated to compensate commissions,” Surefield said. San Diego discount broker iPayOne lived large and then sputtered. Remember Your Home Direct, the hybrid broker that crashed and burned?